Our very own Chef Bill Morris developed this Honey Roasted Pumpkin Soup out of a fondness of cooking with sugar pie pumpkins (note: canned pumpkin puree works great, too!) and the flavor they have when roasted. It is a favorite around the fall and early winter. Chef Bill has shared the recipe with us below - enjoy! 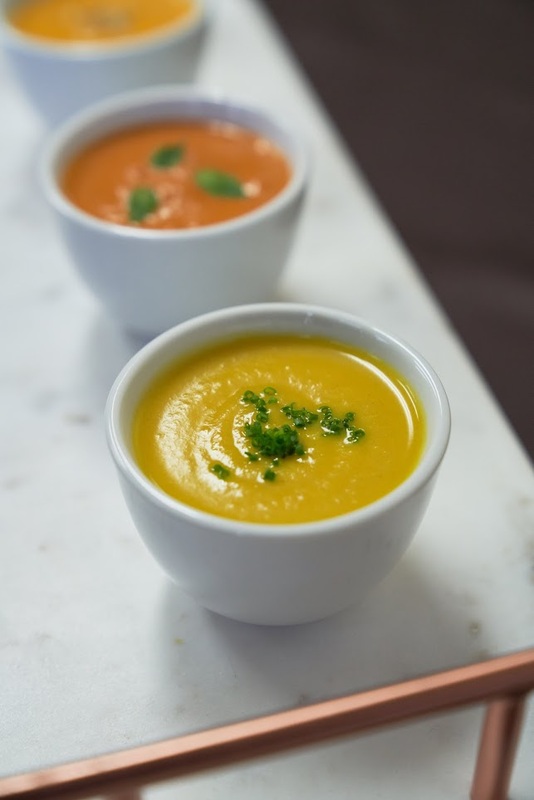 And, while the Honey Roasted Pumpkin Soup is ideal for home prep, you will find many other delicious soups ideal for a variety of catering needs on our Winter Events Menu. Heat butter in non-reactive sauce pot to melt. Add onions and cook gently for several minutes while stirring. Add shallots, garlic, and ginger. Cook several minutes to soften. Add brandy and Madeira and bring to a simmer. Reduce over moderate heat to half the volume. Add stock and bring to a simmer. Add sachet of herbs. Reduce heat and simmer approximately 45 minutes or until tender. Add honey, cream and butter. Remove sachet bag of herbs and place in blender and blend until very smooth. Can be chilled for several days uncovered and reheated as needed. A sachet bag is a bundle of herbs and spices rolled up in cheesecloth and tied with a string to impart the flavor of them into a soup, stock or sauce. To roast the pumpkin, split, scoop out seeds and pulp, rub with butter and spices. Place onto a baking sheet and roast at 350 degrees until very tender. Cool, and scoop flesh(meat) into bowl. Reserve for soup.